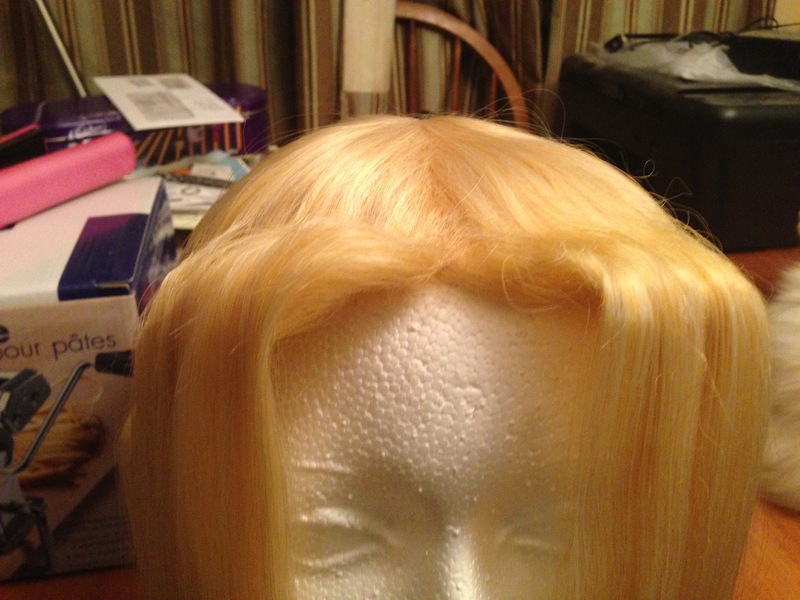 First, I began by adding extra wefts to make it thicker (anime characters have an unnatural amount of hair) – I bought the matching platinum blonde (081) long wefts from Arda Wigs, and cut the wefts along the top seam in about 7″ sections. I found it was easy to part the wig along the wefts using a pencil as a separator to gently peel the top layers up off the weft line I wanted. It was much easier than using my fingers to part the hair and any stray strands were easily picked up using the point of the pencil, then incorporated into the section that was being clipped to the front. When I’d cut my wefts to be about the width of the back of the wig, I used a hair clip to hold the parted hair to the front so I could hot glue the extra wefts in along the existing wefts. I used a low-temp, high adhesion glue. I applied the hot glue to the weft that was not attached to the wig, then, using my fingers, gently pressed the weft up against the wig. I worked in small sections of about 2″ to make sure that I had time to press the weft in place before the glue cooled. I’m not going to lie – the hot glue is hot. My fingers weren’t especially happy with my choice of application methods, but it worked the best. Since I used low-temp glue, the hot glue didn’t leave marks or blisters on my fingers, but I did say “ow” a couple times. When I’d added 12 extra wefts, I parted the hair in the centre and made two pigtails like Lady Tsunade’s tied with purple hair ties. I left a fair amount of hair to create the bangs, and I trimmed them to just below my shoulders. To create the distinctive off-the-forehead anime bangs, I used a 1″ flat iron: comb bangs forward over the face, grasp the hair firmly at the root with the flat iron, bend back toward the back of the head until the flat iron is resting on the head, allow to heat for about 25-30s depending on how hot your flat iron is, gently release the hair and hold in place with your hand until cool, repeat if necessary. I then added Got 2 B freeze hairspray – but not very much ’cause it’ll make the hair look spider-webby. Watch that. As you can see, the bangs aren’t as high off my forehead as I’d like them to be, but they did the trick. I also trimmed the wig at the front to create the layered pieces that are about twice as long as the bangs are (bangs are about 4″; layers are about 7-8″). I cut the short 4″ bangs AFTER I’d used the flat iron to bend back the bangs. I didn’t want to risk cutting the short pieces, then bending it back, only to find out that they were then too short. I don’t have thinning scissors, so I cut the hair in a /\/\/\/\/\/\ pattern (or vertical cuts) using short snips, as opposed to straight across to create a more natural look. When I have a chance to pick up some thinning scissors, I’ll touch up the layered bits and thin them out a bit more at the ends – Tsunade’s hair is almost pointed at the ends. I’m sure there are better ways to achieve the off-the-forehead bangs but I didn’t have much hair to work with so that ruled out any kind of under-structure for support. This was my first attempt at an anime-style wig, and I’m ultimately pleased with the way it turned out. It was comfy to wear, and the bangs held up well. 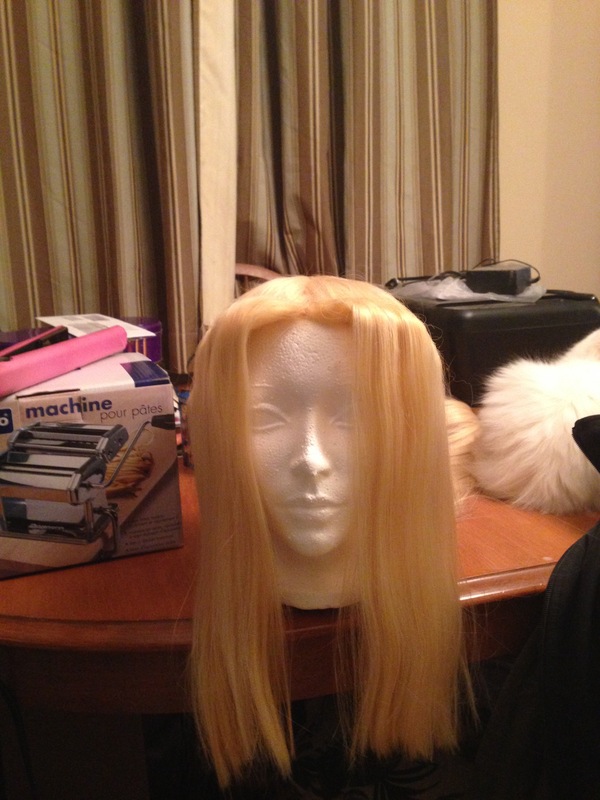 Have you styled an anime wig before? What character did you choose? How did it go? What did you do/use? It Takes A Village To Cosplay! Cosplay Village on Pandaren Monk Wig 1.0! HequembourgMi on Pandaren Monk Wig 1.0!